Jordan Brand made its name with their Air Jordan shoes and has been making noise with their remakes of these famous models. This year, they got a lot of attention with their retro shoes, but they are also making a lot of heads turn with their wide collection of new models like the Jordan Courtside. 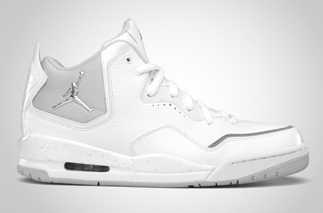 The Jordan Courtside, which is dubbed as a combination of the features of the Air Jordan 3 and Air Jordan 4, will be hitting the market once again anytime this month, this time in White/Metallic Silver – Neutral Grey. This is arguably the simplest colourway as of late but it doesn’t mean that it is inferior than the early editions so this one should not be overlooked! Watch out for it and make sure to grab one!